Welcome to the Enlightenment! The era in which we learned the mass of the earth, invented the steam engine, really invested ourselves in colonialism, and most importantly, played around with the incredible power of electricity without having the foggiest idea what we were doing. In the first installment of this series, we studied practitioners such as Benjamin Franklin, industriously shocking people as ‘therapy’ for pain and paralysis, gleaned no doubt from his extensive experience risking his life flying kites in storms. Meanwhile in England, the preacher John Wesley, when not inventing Methodism, was using the trust he had gained from his parishioners to get away with mildly electrocuting them. I wish I had that kind of credibility. It takes a tremendous amount of money to lure live subjects into my laboratory for such treatment. Luigi Galvani was a quiet, devout, introspective man, prone to avoiding interaction with others (great minds seldom enjoy social environs). Born in 1737 where he remained almost all his life, he lectured at the University of Bologna, his initial work comprising of the studies into the hearing of animals and humans as well as general anatomy During his studies into the ureters of live chickens, he met his wife Lucia Galeazzi (clearly, theaters of romance were slightly different back then). Apparently chicken ureters really did it for her and the the pair married in 1762, with Lucia joining him as his trusted research assistant. The marriage also had the added benefits of providing Galvani access to the well-equipped laboratory of his father in law, Gusmano Galeazzi, as well granting him the position of lecturer and professor upon the elders death. Volta’s opposition to galvanic studies was the catalyst that allowed him to develop the battery, which he termed ‘the artificial electric organ’, or the ‘voltaic pile’, utilizing the different conducting metals he had claimed were the true explanation of Galvani’s twitching frog legs. The ensuing debate was fierce as camps loyal to either scientist attempted to prove and disprove the others theories and became as animated as the all the zapped frogs in Italy. 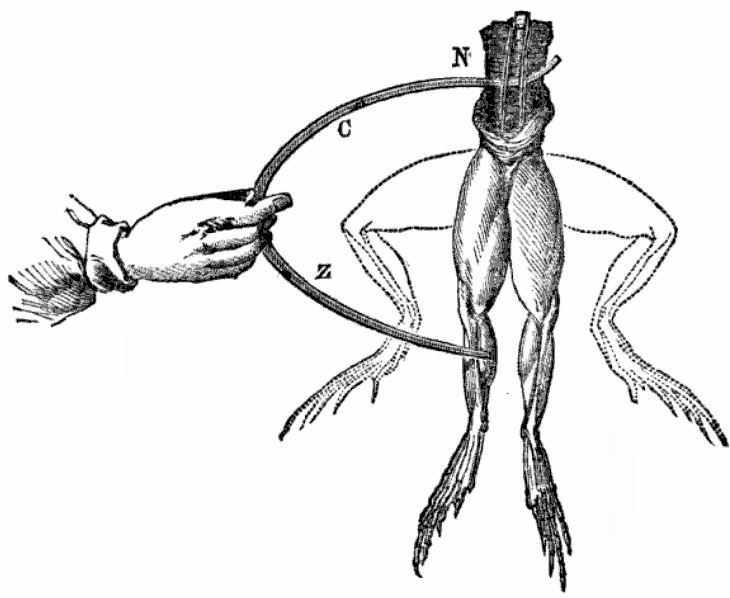 In our next article we move from the electrocution of dead frogs, to dead people. See you then!